It has been most of 4 weeks since my painting trip to Dutch Mountain. The afternoon and evening sun was just as dramatic. The key here is Clean, Fresh paint. I am also very keen on establishing a pigment wash to establish a feel for how the painting will fit on a panel. I start by painting the shapes and wiping out my lights in undertones of cool or warm tone sequence mixed primarily from cadmium red light and quinacridone rose. These are somewhat transparent and allow light to reflect as warm or cool. The undertones set the pace for my painting. Then I gradually build into the layers of colors and values. 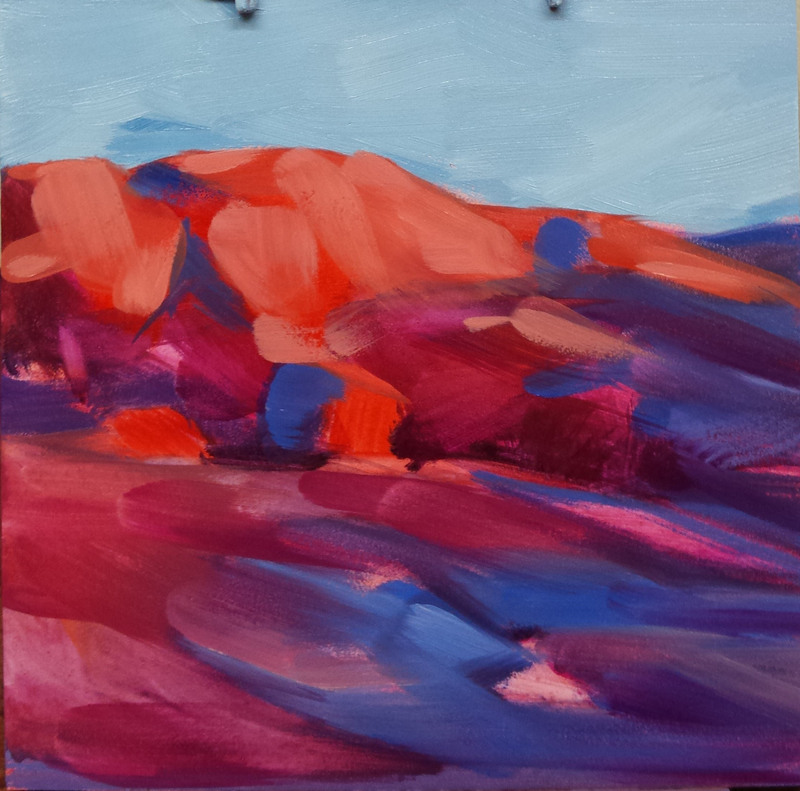 The trick is to build up the colors without quickly making mud on a small 6×6 art panel. I start by painting a thin color coat of the local colors. For a landscape that means mixing and painting the sky first. Then I generally lay in my next layer of cooler shadows in values of blues and violet tones to establish depth and shadow forms. Next, I check my progression and mix for the next layer of warmer lights. Color harmony is very important and adds a dynamic balance to most of my paintings. 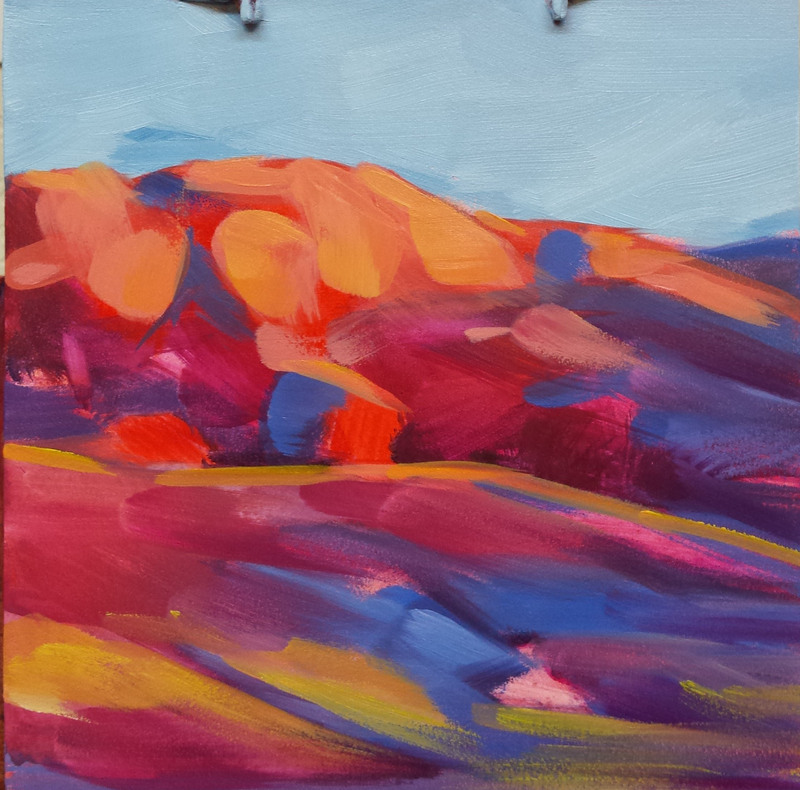 For this painting I chose warm earth structures and cool ground shadows. After establishing my shadow I added yellow tint to all the lights sparkling on the rocks and highlights. I try to mix my paint values and check them as I go, before adding the next layer of light and forms. If it doesn’t match or fit with the harmony I take off, remix and match new color. Greens are much more challenging. I generally try to establish greenery by simply scrubbing in loose greens and lemon yellows over the blue and violet patches. 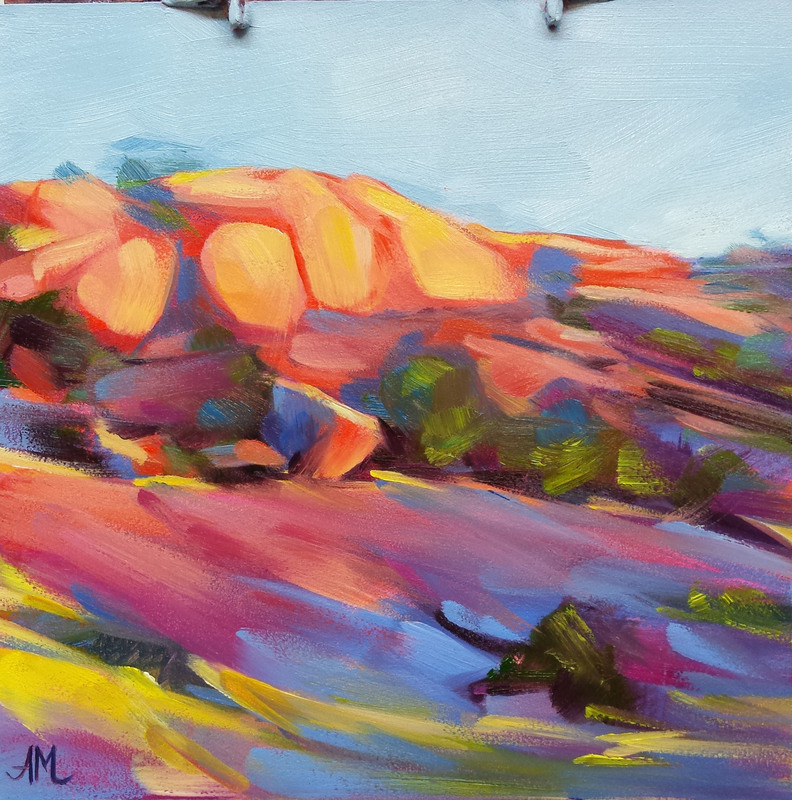 Then check for balance in contrast to finalize the atmosphere, highlights, shadows and rugged surface. Soon after, I begin adding the last few pieces, building up to the brights and final highlights. Clean paint is integral to all good painting. Be sure to know your color ranges and mixtures. Clean paint is important to establishing the mood of a painting. It is critical to preserving reflected light within the painting. Fresh clean strokes quickly establish atmosphere, depth, and volume of a painting through a tight space. The important thing to remember is start clean, work clean, paint clean before you know it you will have beautiful color harmonies. Here is today’s study in the Toy series. This one is for those that love extra thick expressive paint. I applied the paint somewhat thicker since that seems to be the nature of painting without thinner or medium these days. But i do like that it has grit and form to it. However, something to remember, even us artists have our off days and others are just totally disconnected. I spent most of the day trying to push the contrast to pop the dinosaur with complements (opposites on color wheel) thinking Blue Green’s complement was Red Violet. What was I thinking? Its more like Red Orange. That helps.